In palmistry however I was taught that ulna=subconscious, passive, inner and radial = conscious, active, outer. I still cannot equate subconscious with 'outer' nor conscious with 'inner'. Imagination, intuition, creativity is required in any divinationatory craft. yes but don't they originate in the subconscious? Yes exactly. It was you who introduced the fingers into it. Okay, I understand that this implicates that you did not want to include the fingers in the quadrant analysis. But we are talking about the vertical division of the hand... so it would not make sense to only talk about the palm (therefore I had to assume that you were talking about the fingers as well... because you did not mention them explict). Upper radial = fire = active conscious"
You have adopted the idea that conscious and subconscious are actually associated with individual elements, but I didn't say that. I am sorry that the way I wrote it seems to have confused you. Okay, I understand what you are trying to say. But you did write this explicit in your summary-post... so I don't understand why you write "I didn't say that"??? Lynn wrote: The passive/active and conscious/subconscious refer to the division of the palm horizontally and vertically, like a spectrum in each direction. 2) radial to ulna - active to passive. If I re-write it like this, do you understand what I was saying? 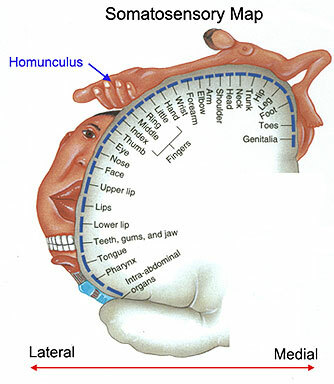 Lower ulna is the passive subconscious quadrant, which is ruled by water. Top ulna is the passive conscious quadrant, which is ruled by air. This is not the same as saying 'water stands for subconscious', nor 'air stands for conscious'. nor is it saying water and air both 'stand for' passive, because water is a passive element but air is an active element. On page 31 Dukes associates 'consciousness' directly with the air element (he writes: "Air = Space/Consciousness"), and his description for the air quadrant' (p.48): "the air quadrant is conscious [and passive]" ... suggests that he describes the pinky + upper ulnar palm quadrant as representing the most 'conscious' parts of the hand. And additionally one could argue that the ring finger can not be much less 'conscious'... because the other most conscious part of the palm is ruled by fire, and the ring finger is ruled by fire as well. Yes I can go along with that. 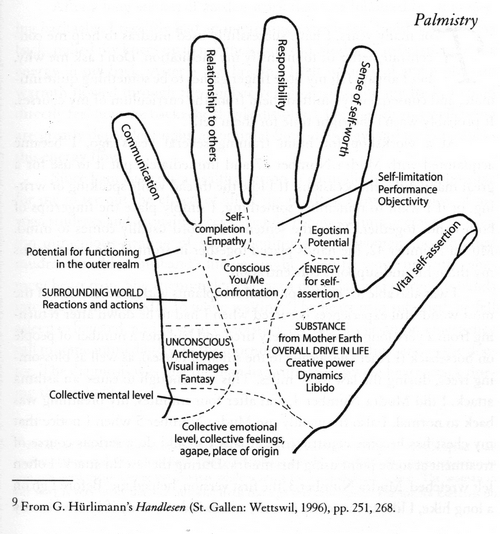 The conscious /subconscious division in 5 elements is more from base of palm to top. Well Lynn, I am very glad to see that you fully understand what I described as the most sensible approach (from the elemental perspective). By the way, which author(s) do you have in mind when you talk about 'palmistry'? I assume that with the world 'palmistry' you are e.g. 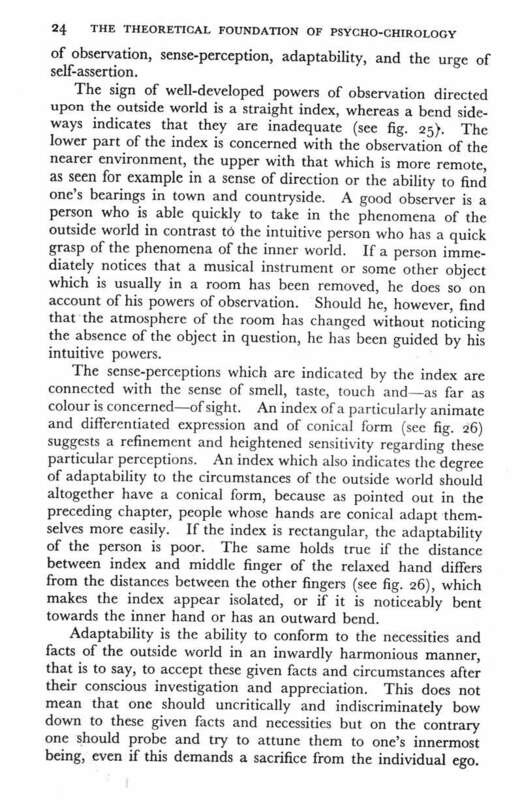 refering to ecletic authors such as Nathaniel Altman (who does not present any fundamental approach to understand the hand at all... featured with lot's of descriptions, but his definitions present many contradictive elements: for example: he associates the radial side of the hand with 'active conscious' and the upper side of the hand with 'emotional/conscious'... but he does not explain the meaning at all, in respective: he talks about 'the material world' and 'the world around us' featured with other vague descriptions that appear to have not much solid ground beneath at all. And meanwhile he is referring to the vocabulary used by psychologists such as e.g Freud to which he links the word 'subconsious'... while Freud has explicit described that the word 'subconsious' is a misleading word that should not be connected to Freud's work at all. By the way, Altman this is also the guy who writes in his old books that the life line represents the expected 'longevity'...only to write in his latest book that the life line does not have a connection with 'longevity' at all). Lynn wrote: So regarding this picture, I still cannot equate ulna side of the palm with outer world, nor radial with inner. Lynn, it appears to me that you keep wondering about this ... but regarding the ulnar side I have already refered to the archetype of mercurius + the fact that in hand reading the pinky is always associated with communication & relationships)! Again, I think one could describe the archetype of mercurius as the most 'outward' oriented archetype. So, in return I could ask you... after making these references, how can one deny that the pinky is associated with the outer world??? From a planetary point of view the moon always reflects the light of the outer world! Sorry, I hesitate to start answering your specified associations regarding the mount of moon... because so far in this discussion we have only talked about the fundamental concepts (apart from my references to some aspects associated with the pinky finger of course). If this were really true (about senses ruled by the moon)... it would seem the fingertips would be ruled by the moon, as they are the most innervated and sensual part of the hands. p.s. However, I would suggest possibly relating it to hormones instead? Patti, our senses include much, much more than just the fingertips. So your association might represent only your perception regarding the senses (not sure that your use of the word 'sensual' is appropriate here). Beyond sight, hearing, taste smell... our touch is not limited to the fingertips at all. This is e.g. visualised by the sensory cortex! PS. In the works of e.g Edo Sprong, Ghanshyam Singh Birla, Sasha Fenton & Cheiro you can find more specific info about the senses are associated with the mount of moon (Luna). Definitely agree that our senses go beyond the fingertips! 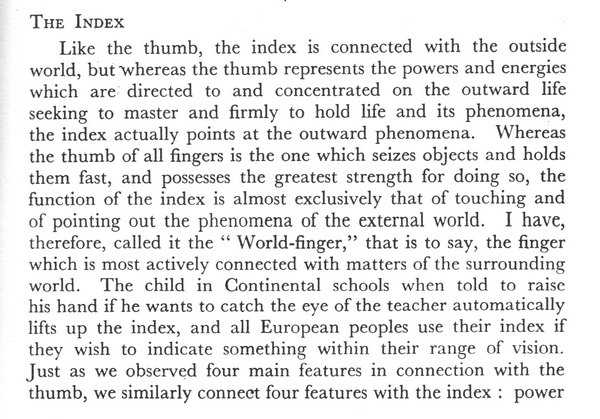 Julius Spier connects the senses with the index finger, and the index finger to the outer world. Patti wrote: Definitely agree that our senses go beyond the fingertips! I just love the way, Julius Spier has explained this so precisely...very practical! The thumb is obviously a Great force in life/palmistry. If it did not have tremendous inner strength, it could not have performed the outer. I dont know what to say here; reason being I dont make strong/vivid demarkations like (a) representing conscious & (b) representing subconscious (c) representing unconscious. Imagination would certianly be more internal. Therefore, I have to agree with you.that they 'originate' from the inside. Thanks for sharing the picture; looks like both Hirschi and Hurlimann belong to the German school that I mentioned in some of my posts earlier in this discussion. PS. One could argue that the 'visual' qualities related to the mount of moon (e.g. visual images, fantasy) also make a connection with the outer world. Although I understand how phantasy also can be associated with the inner world, one could likewisely argue regarding some elements associated with the mount of venus (regarding e.g. libido)... so there is probably no clear ground to associate the mount of moon solely with the inner world and the mount of venus with the outer world, etc. and there are 3 more full pages of info just on the index! I spent the afternoon reading old posts in the Cafe and saw that this same topic of the inner and outer sides of the hands was brought up by Christopher Jones more than a decade ago. Interesting to see how we've 'evolved'. Christopher stated numerous times that he no longer supported ether as relating to the thumb or any other part of the hand for that matter, unless maybe the middle of the palm. I don't think you can separate inner from outer or subconscious from conscious. It's like light and dark (or your analogy that the moon does not shine by its own light). If you take away light, you have darkness. Light shines into the darkness so far and loses itself in the dark. The energy of the hands are the same... one polarity fades into the other, but I don't think there is a complete single energy standing alone. There is no complete outer self portion or complete inner self portion - the outer self's resource is from the inner self. We are conscious of having a subconscious, and the subconscious of its own comes into awareness. What may be embarrassing and personal to one may be exactly what another writes on their popular blog about themselves. Inner and outer, conscious and subconscious are simply words to describe these opposites within and outside the self. There is no absolute and common dividing line - it is multidimensional. Imagination, intuition, creativity is required in any divinatory craft. I don't know what to say here; reason being I don't make strong/vivid demarcations like (a) representing conscious & (b) representing subconscious (c) representing unconscious. Imagination would certainly be more internal. A addendum to the above said. Speaking of it/them 'originating' from the 'inner' is true, but there is more to that. With the aid of "Moon", we are able to perceive ourselves/ our feelings..
None of the known palmists have mentioned this in these words, though! Quadrant analysis is only about the palm. Sorry if I don't explain things about 5-element hand analysis in detail - it is second nature to me and I forget that most people haven't studied it! To me it is obvious that quadrants do not include fingers! "Lower ulna = water = passive subconscious"
I was describing the rulership & principle of the quadrant, not of the element. Yes, but air rules the mind, nervous system, autonomic nervous system - which also includes 'subconscious'. I have already explained that the way I see it, ALL the fingers represent different types of consciousness, as Dukes also says in chapter 8 eg page 67. Martijn (admin) wrote: By the way, which author(s) do you have in mind when you talk about 'palmistry'? "Ulna = subconscious and /or inner"
"Radial = conscious and/or outer". For sure my teacher Beleta, David Brandon Jones "Practical Palmistry", Sasha Fenton & Malcolm Wright "Living Palmistry", maybe more? Martijn (admin) wrote: Lynn, it appears to me that you keep wondering about this ... but regarding the ulnar side I have already refered to the archetype of mercurius + the fact that in hand reading the pinky is always associated with communication & relationships)! Patti, I understand the fingers as a whole, from digital mounts to tip, as having some connection with the hormones/ endocrine system. eg menopausal women and the 'crazy paving' of white lines crossing the fingertips. Thick basal phalanges & high mounts in underactive thyroid....etc. "Overactive" apollo finger & too much adrenaline / testosterone. Lines on thumb top phalanx relating to pituitary (reflexology also relates thumb to pituitary). Moon mount can also reflect hormonal changes, eg red colour sometimes in pregnant women & all women at 'time of the month'. ?? Patti thanks for sharing these. I was happy to see that Julius Spier also connects radial side (thumb & index) to outside world. Tho I remember that he also reads lines in reverse to the way I read them! ok there are more posts to think about & reply to, but I'm done for tonight!!! I am not used to the terminology (ulna & radial). I guess ulna is inner & radial is outer; Right? Lynn, I refered to the planetary perspective as a symbolic representation to explain how 'fantasy' can be understood as a mental phenomenon (which of course by principle relates to the inner world) that for a large part origins in how people related with the outer world. So, I think it would require a full analysis of the associated qualities with the mount of moon... before one can say that the mount of moon relates to the inner or outer world. "It is entirely because of the possession of imagination, a quality of mind which does not belong to the lower animals, and which gives to man the ability to form mental pictures, that certain words, sounds, or signs convery meanings - in short, that we have the power of speaking and communicating with each other." So, one can visualize this as how the mount of moon (imagination) provides the necessary mental foundation for the manifestation of mercurius (communication). Therefore I think it is proably far to easy to simply assume that phantasy is the key-element for the mount of moon... because phantasy is actually a quality of the mind - while the mount of moon is said to represent a part of the 'body' (where the fingers are associated to represent the 'mind'). The postmodern intersubjectivity of the 21st century has seen a new interest in fantasy as a form of interpersonal communication. Here, we are told, 'We need to go beyond the pleasure principle, the reality principle, and repetition compulsion to...the fantasy principle ' - 'not, as Freud did, reduce fantasies to wishes...[but consider] all other imaginable emotions'; and thus envisage emotional fantasies as a possible means of moving beyond stereotypes to more nuanced forms of personal and social relating." ... ... ... Looks like in this discussion we are confronted with that the typical 'eclectic' use of vocabulary leads to fundamental problems as soon as one starts questioning the fundamental principles & definitions behind the words! Ulna side of the hand is the little finger side, radial side is the thumb side. Lynn, at first sight this may appear to make sense. However, if fingers & thumb would get associated with 'outer world'... this would create a contradiction with the idea that the fingers represent the 'mind'. Because by principle, the 'mind' is in psychology defined as "the complex of cognitive faculties"... and since cognition and thought relate to our inner world, your proposal would not make sense in the perspective of the traditional representation of body & mind in the hand. Do these considerations of mine make sense now for you?